So the ice has melted and you have surveyed your property and neighborhood and to your shock and horror discovered that the blizzard has fallen or irreparably damaged some trees. The general rule is - remove a tree, add a tree. How do you do it? A short review for those of you who didn't read Friday's post. If the tree is a street tree, call the Mayor's Call Center at 311, and request tree removal by the City's Urban Forestry Administration (UFA). The tree, if still standing, and especially if near power lines, will most likely be removed in three stages. One crew will remove the branches, a second will take it down to the stump and a third will grind the stump. Why multiple stages? Think assembly line efficiency. 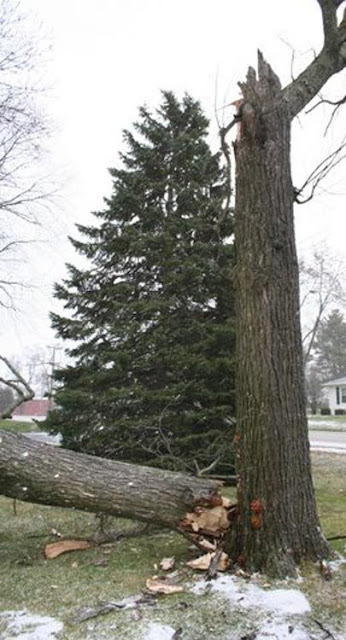 If tree is on private property, call a certified arborist. Click here to find a certified arborist. Trees on private property can most times be removed all in the same day and unless the tree was diseased a replacement tree can be planted immediately. This is where Casey Trees comes in. Casey Trees offers multiple programs to help homeowners and groups add trees to their property for free or nominal amount. Here are a few options to consider. Community Tree Planting (CTP) - The CTP program, established in 2005, is a grassroots approach to planting trees in neighborhoods throughout the District. Individuals and groups interested in adding trees – ten or more – to their apartment complex, school, church, park, synagogue, or even private yard may apply. Applicants propose a planting site – in DC only – and locations for the trees. Successful applicants are assigned a Casey Trees-trained Lead Citizen Forester as a technical advisor to help applicants determine which tree species to plant and where, and develop a planting plan and maintenance schedule. Casey Trees provides onsite planting help all the required tools and trees. Requests for a fall (Oct - Dec) planting are due June 15, 2010. Treescape Design Workshops (TDW) - TDWs teach basic environmental concepts to allow individuals to incorporate trees in their yard or garden landscape. Casey Trees' experienced landscape design experts work with homeowners to create a treescape plan for their residential property. Participants are encouraged to bring photos of their yard, a sketch of the property, location of existing power lines and trees, yard measurements, and an idea of what you would like your treescape to do for your home i.e. provide shade, seasonal color, lower utility bills, etc. Each participant receives a FREE shade tree (approx. $250.00 value) delivered to their home. Advance registration is required; space is limited. RiverSmart Homes - Through a partnership with the District Department of the Environment (DDOE) homeowners may request shade trees be planted on their residential property for $50.00 per tree this spring. DDOE processes the requests and a Casey Trees representative visits individual homeowners determine the most appropriate trees and locations for planting in each yard. Once the tree species and locations have been chosen, Casey Trees will then schedule the planting. The cost of planting is included in the $50 co-payment. Space is the only limit to the number of trees we can plant on each property. Tree Rebate - Homeowners who purchase and plant trees on residential property in the District may request a rebate for up to $50.00 per tree (3 trees max per property). Most trees with the exception of invasives and Ash trees qualify. The Tree Rebate helps make adding trees to residential property affordable for the average homeowner and allows individuals to select trees not covered by the RiverSmart Homes program. Design Resources - Casey Trees provides Design Resources for both residents and developers. Resources include Green Issue Briefs, How To’s, Lunch and Learns and more. These resources provide DIY instruction and simplify the tree selection and planting process. Remember - remove a tree, add a tree. We can help! THE BLIZZARD IS OVER. NOW WHAT?